VICTAS Dyna Seven is the new multi-talent among VICTAS’ premium blades. 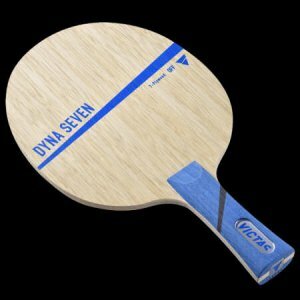 Thanks to the extra-large Sweet Spot of the 7-ply Off-blade and the resulting high control, the Dyna Seven is the best choice for variant-rich and controlled attacking. The special ply-structure provides for excellent control/speed balance both in active attacking situations and for passive blocking or counter-hitting.